When pellet grills first came on to the scene, there were many pit masters out there who had been barbecuing for years who believed they were easy – almost too easy. After all, barbecuing and smoking meat was supposed to be hard, right? If you’re not chopping the wood, then breathing in the smoke and charcoal dust and working to make sure the smoker maintained a steady temperature would last for most of the day – and even into the night. Many believed that no self-respecting barbecue master would fall for the idea of just “set it and forget it.” Most believed that the pellet grill was going to be a fad that would eventually smolder out. However, that’s been a few years ago and these days, the HPBA, or Hearth, Patio, and Barbecue Association has reported that pellet grills are perhaps the hottest trend in the barbecue world. After all, it provides you with the convenience of a gas grill, but the flavor that comes with a wood smoker. So, what exactly is a pellet grill? Think about a classic barrel smoker with a hopper mounted on the side, which replaces the traditional firebox. Then again, you might want to picture a stainless, super grill with a hopper located in the back. Most pellet grills are electric and therefore, run on standard electrical current. Simply plug it in to the nearest outlet and turn on the digital controller. At that point, an auger rotates, delivering pellets from the hopper into the fire pot, which has an igniter rod. The rod will glow red hot for a few minutes and ignite the pellets. Then, the heat and the smoke from the burning pellets is diffused by blower fans that are constantly running, and metal plates located under the grates. In the beginning, there were only two companies that manufactured these types of grills for household use. However, once the original patents expired, the floodgates opened, and many manufacturers began producing them. These days, the pellet grill is considered mainstream and there are more than 20 different brands on the market in North America. Many contemporary pit masters have begun to embrace this revolutionary way of smoking meat, which has led the more old-school pit masters to complain because after all, they still think that a pellet grill is much easier than it should be. So, how do you know if a pellet grill is right for you? Following are a few of the advantages and disadvantages. A pellet grill is extremely versatile; you can do so much more than just smoking your meat. You can use it to barbecue, smoke, grill, roast, bake, or braise. You can cook almost anything you can think about from braised short ribs to crisp chicken wings and everything in between. You can also use your pellet grill to make a delicious crème brulée. Just like a gas grill, a pellet grill preheats fairly quickly; it only takes about 10 to 15 minutes. The design of a pellet grill discourages flare-ups. There are some models that allow you some control over regulating the temperature of your grill in increments of 5 degrees. There is a thermostat located in the cooking chamber which sends signals to your controller and regulates the delivery of the pellets. Due to the simple fact that a pellet grill is very similar to a convection oven in the way that it works, you don’t have to worry too much that it will cook the food unevenly. Typically, when you use a pellet grill, you don’t over-smoke your food. The flavor of meat smoked on a pellet grill will be a lot subtler than the smoky flavor that you get from using a charcoal or straight wood fire. You can find them in a variety of sizes from small to large household units. If you wish, you can also get a commercial-size unit which can be used to cook pulled pork for a crowd or even a whole hog if you need it to. If you want a stronger wood flavor, you can always add additional hardwood chunks or soaked wood chips on the diffuser plate. One thing to be aware of is that you can get wood pellets in a variety of different flavors: alder, apple, bourbon, cherry, hickory, maple, mesquite, or pecan. You can mix and match the different flavors and you can change them quickly. While weather conditions and temperature settings do play a factor in how long a bag of pellets will last you, one 20-lb. bag should last you for several cooks. In normal conditions, you’ll use about ½ pound of pellets in an hour on the smoke setting. When you switch to the high-heat setting, you’ll use about 2.5 pounds per hour. There are some pellet grills that offer a cold smoker accessory, which is ideal for smoking cheeses or Nova Scotia salmon. Just as with anything else, there are a few disadvantages that come with using a pellet grill. First of all, they depend on electricity to function, which means that unless you have a generator or a power inverter, a pellet grill is not really all that portable. Second, even though you’ll find that they are marketed as a “grill,” you’re not going to get a dark sear or grill marks on your meat. This is because it runs on indirect heat driven by fans. Most people see these more as smokers instead of grills. You can preheat your skillet, plancha, griddle, or grill grate directly on the pellet grill for about 20 minutes before you start the cooking process if you want to increase the amount of caramelization you get on your meat. A pellet grill is fairly expensive, starting at around a few hundred dollars and going up to over $4,000. When it comes to cooking your meat, one thing to keep in mind is that the higher the temperature of your pellet grill, the less smoke you will get. 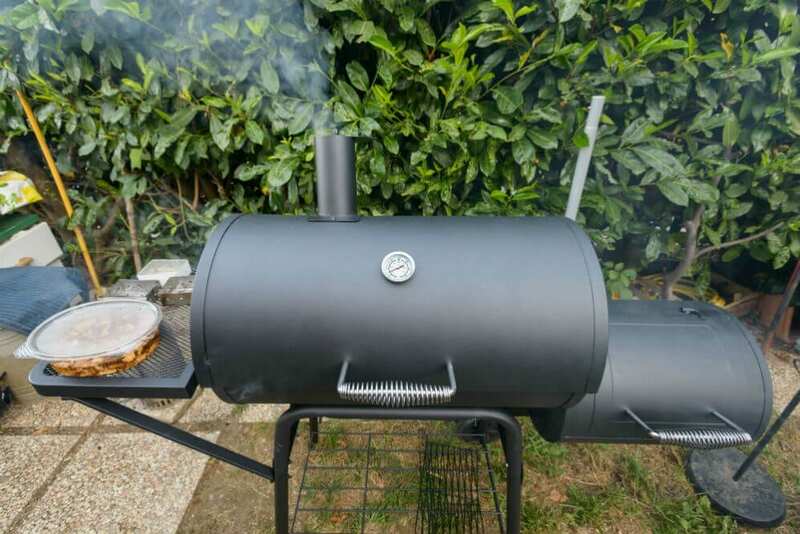 The best smoke flavor will be achieved at under 250° F.
Anytime you have a grill that has moving parts or is electric, you run the risk of it breaking down. This is not a risk you have when it comes to wood or charcoal grills. If your pellets are exposed to moisture, they will disintegrate. Therefore, individuals who live in climates that are humid must make sure they keep the pellets dry. The best thing to do is keep them inside in an airtight container.